Plating on Plastics Market size was over USD 450 million in 2017 and industry expects consumption of above 150 million square meters by 2024. Increasing consumer preference for fuel efficiency and production of light weight automotive using plastic components in grills, exterior & interior components and parts along with providing decorative appearance should boost plating on plastics (POP) market size. Global automotive sales reached over 88 million units in 2016 at a growth rate of over 4.5% during the forecast period. Push to reduce automotive vehicular weight in an effort to minimize fuel consumption by complying current industry standards will drive product demand. Factors including appearance, wear resistance and costs are likely to drive plating on plastics demand for domestic fittings applications. Growing demand for high performance substitutes for metal with lightweight composites in electronics, automotive and domestic fittings industry should propel product demand. POP technology has offered a viable way for manufacturers to introduce metallic surface benefits without compromising structural advantages of lightweight composites including plastics. 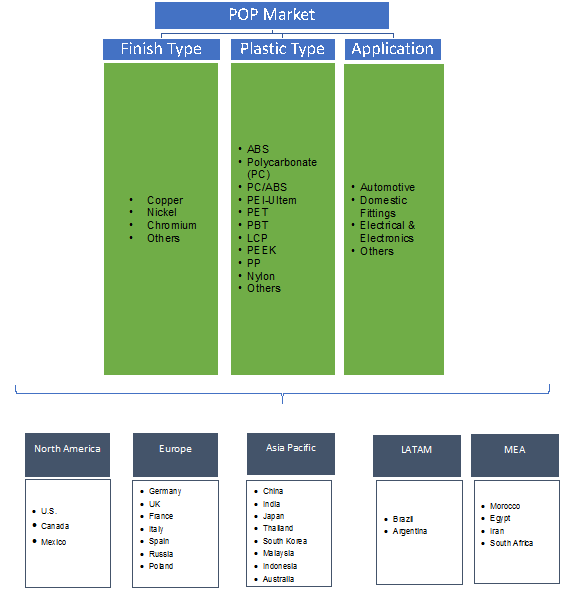 Rising application of POP technology in automotive and electronics industry involving metals including chrome, nickel and copper plated onto a polymeric substrate drives industry size. These plating offers metallic lustre and properties along with enhancing corrosion & abrasion resistance and toughness of the surface and component. Innovative technologies improve ease of applicability replacing conventional metals with plastics in construction, medical devices and consumer goods. Germany is expected to lead the way in electric car production by surpassing production by over 1.3 million units by 2021. Stringent environmental regulations by governing agencies including EPA, OSHA & REACH are anticipated to accelerate plating on plastics market growth over the forecast period owing to increasing demand for using lightweight components in automotive and electrical industries. Dependency on hexavalent chromium for plating process might hamper industry growth due to high toxicity levels induced. Plating on plastics market size from domestic fittings application was over 9 million square meters in 2017. This rise in demand can be attributed to its application in home renovation, water systems, kitchen & bathroom fixtures. Use of POP technology in household fittings and components improves its aesthetic appearance and strength along with offering design flexibility and performance. Rise in disposable income with increasing spending capacity of consumers should drive demand for product in near future. 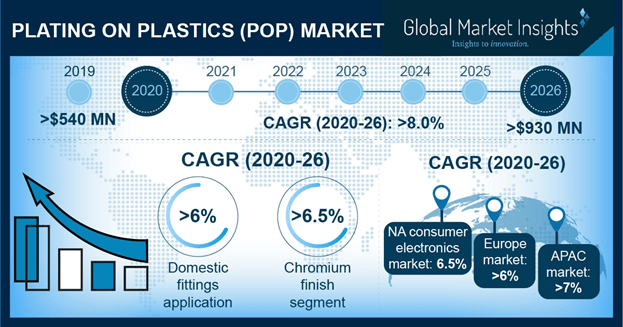 Plating on plastics (POP) market size from electrical & electronic applications may register gains at over 5.5% by 2024. Nickle and chromium plating improves aesthetic appearance of plastic trims on mobile phones, computer, knobs & buttons on electrical goods. Copper plating on these components also strengthens and protects the substrates along with making it electrically conductive. They are usually cheaper compared to gold, silver and palladium plating thus driving product demand. Plating on plastics (POP) market size from automotive application should witness significant gains at over 6.5% during projected timeframe. Applying of metal coating on automotive plastics is a high precision method which can be customized according to its functionality and decorative factors. Rising fuel prices forces automotive manufacturers to produce fuel efficient vehicles reducing its vehicular weight replacing components with light weight composites for exquisite finish and weight driving demand for POP industry size. ABS substrate plating on plastics market size is anticipated to surpass USD 550 million during projected timeframe owing to its wide preference in chrome plated plastics as it offers easy etching and adhesion of key raw materials such as chromic acid, nickel and copper. ABS is also inexpensive compared to other plastic types and easy to metalize thus driving industry size. POP market size from PEI-Ultem may observe strong gains at over 7% by 2024 due to its easy and quick application. Inherent flame resistance property, chemical resistance, high strength, stiffness, and elevated thermal resistance should drive product market growth. They are also extensively used in high temperature performance areas. Plating on plastics market size from nickel finish is expected to surpass USD 250 million in predicted timeframe owing to its use in industrial application. Nickel provides bright presence, resistance to corrosion, heat, and friction wear. Incorporating tin and tungsten into nickel-based POP enhances hardness and resistance for its utilization in automobile industry thus propelling the product demand. Asia Pacific led by, India and China plating on plastics market size is projected to surpass USD 230 million by 2024 owing to strong application in automotive industry. Rapidly rising population in the region along with increasing disposable income has driven demand for passenger and commercial vehicles leading to increasing prospect for POP market. Introduction of FDI and new governmental initiatives has led to increase in automotive and OEM production due to growing investments from multinational firms and companies. Europe driven by UK, and Germany plating on plastics (POP) market demand may observe significant gains over 6% by 2024 owing to being production hubs of key automotive industry players including BMW, Volkswagen, Renault and Mercedes. Key regional players are increasingly spending on its R&D activities to enhance its product & application portfolio. Manufacturers are shifting their production base towards emerging economies owing to new market opportunities thus propelling industry growth. Global plating on plastics market share is moderately fragmented with major industry players including Arteraft Planting, Atotech, Bolta Werke, Chromoplastica, Cybersheild, and Enthone. Other industry participants include Dixline, Techmetals, SRG Global, Sharretts Plating, and Sarrel. Manufacturers are focused on developing new & innovative products to increase their market share and retain their consumer base. They are also investing heavily in research & development to sustain the changing market dynamics. Rapid technological advancement in resin development & production technology have resulted in replacements of metals to plastics in recent times in automotive and electrical applications. Plastics components are preferred owing to its flexibility, corrosion properties, reflexibility, and light weight. Plating on plastics provides a conductive layer which helps in strengthening, heat resistance, chemical resistance and can be moulded as per desired shapes. It brings appealing bright finish to surface.